Famitsu has revealed that Marvelous is working on a new PlayStation Vita title called Uppers. Produced by Senran Kagura series producer, Kenichiro Takaki, with scenario features by Yukinori Kitajima, and character design by Hiroaki. Uppers is an action game that takes place on a island where fighting is common place. The outlaw residents of the island use only their fists when entering a brawl. The main character, Famitsu reveals, is named Ranma Kamishiro. He is not skilled in martial arts and finds his days spent on the island boring. However, Kamishiro, has enormous strength that he uses to fight enemies. The fighting mechanics will focus on juggling and combos using repeated button presses (think Senran Kagura). Did you think a game by Takaki-San would go without his signature “touch”? During fights girls will cheer you on and there will be a chest grabbing mini-game. 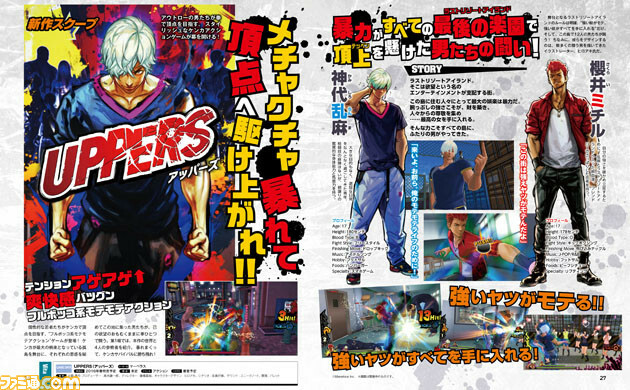 Uppers will release in Japan Spring of 2016.